The New Zealand Bio-Recording Network Trust (NZBRN) intermittently runs free workshops where you can learn more about how to use iNaturalist NZ — Mātaki Taiao to discover and document the nature in your favourite places. 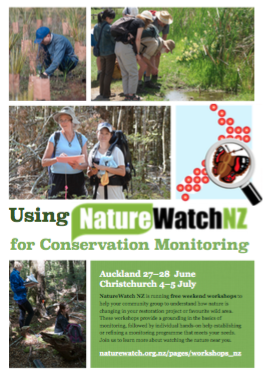 Here are some of our previous workshops, organised under our former NatureWatch NZ name. We are running two one-day workshops on NatureWatch NZ in Wellington this December. The Friday event will be targeted at biodiversity professionals like council staff and the Saturday event for community groups, although you're welcome to whichever day suits you best. The venue will be the Leonard Cockayne Centre at Otari Wilton's Bush, generously provided by the Wellington City Council. The workshops will cover all the basics about how to get the most out of NatureWatch NZ and what NatureWatch NZ can do for you. Plus we'll have NatureWatch NZ gurus on hand to help more experienced users to things like upload and download bulk data. Register now at www.eventbrite.co.nz. Note that spaces are strictly limited due to our venue so if you're sure you're coming, please don't delay in registering. 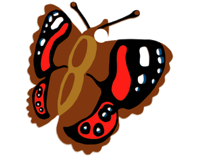 For more information, we're at info@inaturalist.nz. Here are the latest details for this Christchurch weekend workshop, and here are the latest details for the previous weekend's Auckland workshop. This year, NatureWatch NZ is working with Nature Space, Auckland Council, and Environment Canterbury, to help you monitor nature in your local restoration project or favourite wild area. How quickly is wild nature returning to your restoration site? What species are still missing? Are pests and weeds reducing the native biodiversity at your site? Answering these questions requires monitoring. Monitoring is much easier, and more interesting, now that you can connect to naturalists throughout NZ using NatureWatch NZ. These workshops provide a grounding in the basics of monitoring, followed by individual hands-on help establishing or refining a monitoring programme that meets your needs. Join us to learn more about watching the nature near you. While these workshops are open to all, preference will be given to Nature Space affiliated restoration groups. Nature Space provides online support for groups, individuals and landowners undertaking ecological restoration in New Zealand. Especially for day 2 of the workshop, we encourage groups to consider sending 2 to 3 people that consider themselves to be moderately ‘tech savvy’ (they know the very basics of using a spreadsheet to enter and save data). Learn the key functions of the NatureWatch NZ platform and how to utilise its capabilities to record, map, and learn more about NZ biodiversity. Understand the principles of monitoring and work through examples of simple approaches that you can use to inform your restoration and conservation management. Make a group monitoring project using NatureWatch NZ and populate this with new records as part of a field recording exercise. Spend one-on-one time with NatureWatch NZ experts to plan and refine your own monitoring projects. If your group is already monitoring, we’ll work with you to integrate it into NatureWatch NZ to do more. If you’ve got data, we’ll work with you to wrangle it into the right format for NatureWatch NZ and help you use your data to answer your questions. If you're keen to attend, please fill in the registration form and send it to info@inaturalist.nz. As part of the Matariki Planting Day at Orakei, NZBRN chair Colin Meurk and colleagues will be stationed at Orakei marae throughout the day (and evening if there is demand) to provide an introduction and demonstration of the use of NatureWatch NZ. People can join us making observations of the locations and sizes of the plants planted during Matariki Planting Day so that we can track their growth on NatureWatch NZ. Kindly hosted by Ngati Whatua at Orakei Marae. We're working on the details of a half day workshop in Dunedin, tentatively schedule for Quuen's Birthday Monday, 1 June, 2–5 PM, at the Otago Museum's Hutton theatre in central Dunedin. We'll add details as they become available. One of the NatureWatch NZ founders, Jon Sullivan, will be giving a talk in Dunedin on observing plants with NatureWatch NZ to the Otago Botanical Society on 3 June.